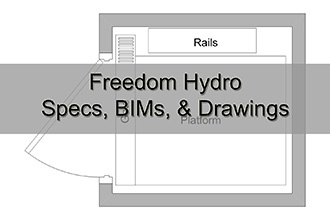 Freedom Hydro: The Freedom Hydro is an economical and reliable hydraulic home elevator. This elevator requires a nearby machine room to house the pump/tank and controller. This elevator has several options for cab finishes, gates, and doors. Melamine or unfinished veneer walls are standard. Raised hardwood and glass walls are optional. Standard sizes of 36” x 48” and 40” x 54”. Custom sizes available up to 15 sq ft.
Travel speed is 40 ft per min. 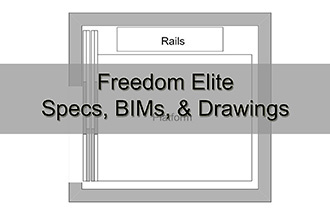 Travels up to 6 stops and 50 ft.
Freedom Elite: The Freedom Elite is a heavily upgraded version of the Freedom Hydro. This elevator has a larger capacity, larger cab, and sliding doors. Standard sizes of 48” x 54” and 40” x 54”. Custom sizes available up to 18 sq ft.